Both Thunderbolt 3 docking stations and bus-powered USB-C hubs are nothing new. But what about bus-powered Thunderbolt 3 docking stations? Ah, that is a much more rare product. In fact, today, StarTech is launching two bus-powered portable Thunderbolt 3 docking stations that it claims are an "industry first." If you aren't familiar, "bus-powered" means there is no need for an AC adapter -- the port on your laptop powers the dock. This is great because, without a power adapter, you have one less thing to carry. Why are there two models? Well, while they are both similar, they are are also quite different. The TB3DK2DP features two DisplayPort connections, a USB 3.0 Type-A port, and gigabit Ethernet. The TB3DKM2HD in comparison has two HDMI ports, gigabit Ethernet, a USB 3.0 Type-A port and a USB 2.0 Type-A port. Both portable docks can push two 4K monitors at 60Hz, but only the DisplayPort variant can do 5K at 60Hz. Neither feature female USB-C ports. 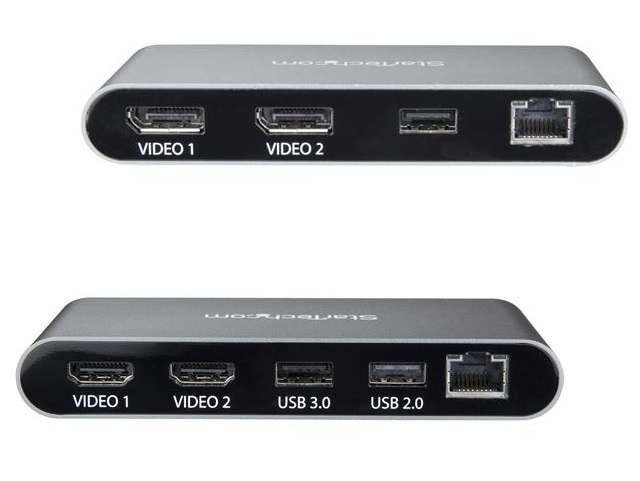 "These mini docks allow users to connect two DisplayPort or HDMI monitors with 4K resolution without the need for additional adapters. The docks also provide a USB 3.0 (Type A) device port and Gigabit Ethernet port for wired network connections. The compact size of these docks make them ideal for hot desk (hoteling) workstations or cubicles and permanent space restricted workstations. Their portability and essential port connections also make these docks ideal for travel and mobile usage with MacBook Pros or Windows based Thunderbolt 3 laptops. Business and creative professionals will benefit from the full 4K 60Hz ultra HD resolution on up to two displays, making this product particularly useful for producers, designers, engineers and architects," says StarTech. Nirav Gandhi, Director, Product Development, explains, "StarTech.com reinforces its position as a leader in the innovation cycle with the introduction of the industry's first bus powered Thunderbolt 3 docks. 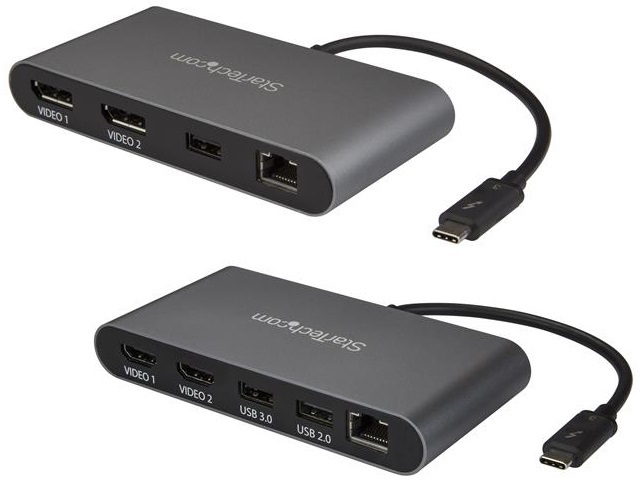 These new docking stations deliver cost effective Thunderbolt 3 connectivity without compromising performance while enabling the essential connections users need to be productive such as dual 4K 60Hz ultra HD resolution displays, Ethernet and wireless or wired keyboard/mouse." Up to two 4K DisplayPort monitors running at 60Hz refresh, or a single 5K 60Hz DisplayPort monitor (only TB3DK2DP) by connecting two DisplayPort cables. Bus-powered so no external power supply required. Built-in Gigabit Ethernet port and support for PXE Boot. Compact size with integrated 20cm Thunderbolt 3 cable making it convenient for space-saving workstations and portable for mobile on-the-go professionals. Generous spacing around USB 3.0 Type A port (for a compact/travel product) to accommodate most standard USB flash drives. Additional USB 2.0 port on HDMI model. Flexible connectivity to MacBook Pro or Windows laptops with a Thunderbolt 3 port. If you are interested in buying your own, the DisplayPort variant can be bought here for $164, while the HDMI model can be had here for $183. Which one do you like better? Please tell me in the comments below.